In the early hours of Saturday morning the Rachel Corrie was hijacked by Israeli forces. Its detention by the Israeli government brings to an end this particular phase in the international effort to break the illegal siege of Gaza. All of those involved in planning, assisting, procuring supplies, raising funding and taking part in the Flotilla are to be commended for their courageous actions. The Irish contribution to the Freedom Flotilla was significant. People and organisations responded very positively and provided the aid that filled the holds of the Rachel Corrie. And Irish public opinion, with the exception of some unionists, was clearly in support of the humanitarian aid workers and appalled by the violent response of the Israeli government. But the campaign to end the illegal siege of Gaza, to end the illegal construction of settlements on Palestinian land, secure the demolition of the illegal separation wall and to achieve freedom and justice for the Palestinian people, will continue in the time ahead. The Israeli government’s attack on the flotilla and the killing and wounding of aid workers has brought a new level of condemnation but the real challenge is to mobilise international opinion and political pressure so that the situation for Palestinians improves. A report published a few weeks ago by the United Nations ‘Office for the Co-ordination of Humanitarian Affairs occupied Palestinian territory’ gives an insight into the extent of the hardships imposed on the Palestinian people of the west Band and Gaza strip by the Israeli government. The report reveals that the situation in the Gaza strip ‘presents severe impediments to humanitarian operations.’ According to the UN the restrictions imposed by Israel in June 2007 have either prevented progress on planned humanitarian projects or created significant delays. The United Nations Relief and Works Agency for Palestine Refugees in the Near East – UNWRA – reported that 24 construction and infrastructure projects have been blocked. This includes 12,000 Palestinian homes destroyed or damaged by the Israeli assault last year and 100 schools. It also includes health facilities and sewage infrastructure. A critical side affect of the Israeli government’s restrictions is the additional financial costs it imposes on the humanitarian community and the way in which its ability to respond to urgent humanitarian issues is severely limited. So, there is a lot of solidarity work to be done in the time ahead. Many thanks to Joan Mateer for her diligent research work. Joan’s family originally hailed from Ardoyne before moving to Rathcoole. 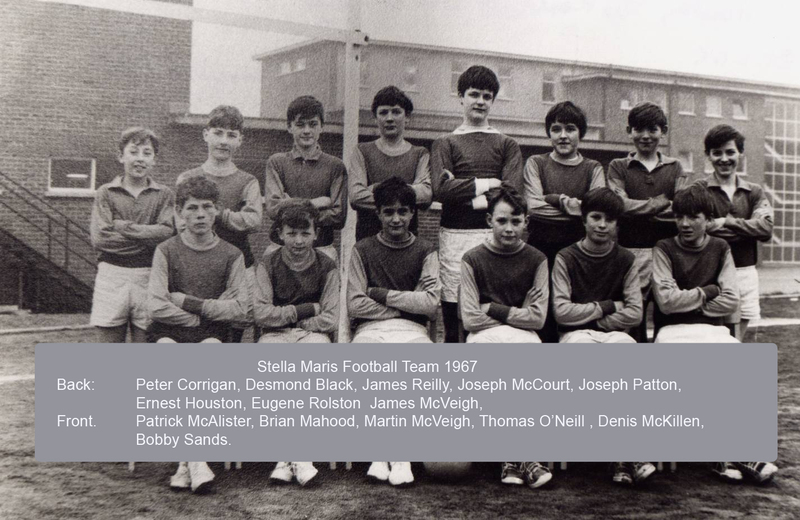 Joan attended Stella Maris Secondary School in Rathcoole – the same school as Bobby Sands. Thanks to her and to stellamarissecondary.com this blog is pleased to post a photograph of a young Bobby Sands. The Stella Maris website contains details of 26 past pupils who died during the conflict. This ‘Death Toll among Past Pupils’ is a sad reminder of the human cost of the conflict. The person who compiled this poignant record is to be commended. He or she tells how: “Twenty six past pupils whose names are known were killed during the ‘troubles’. Of these, twenty four were boys and two girls. Most were in their late teens or early twenties. One, John Rolston, was murdered within two days of leaving school. Three were killed by the Provisional IRA, another three accidentally when handling explosives, nineteen including the two girls by loyalist paramilitaries and one, Bobby Sands, died in prison on hunger strike shortly after he had been elected M.P. for Fermanagh and South Tyrone. Eight families who had one or other parent killed in those years also sent children to the school. Of all those who lost their lives Bobby Sands is the best known. He attended Stella Maris from 1965 to 1969. Coming from a very supportive and close knit family he was well regarded by both staff and pupils and a pleasure to teach. 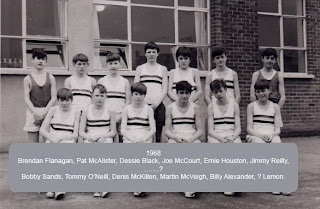 He was keen on sport and was a member of the local Star of the Sea youth club, where together with several of his Protestant friends he played on the club team. 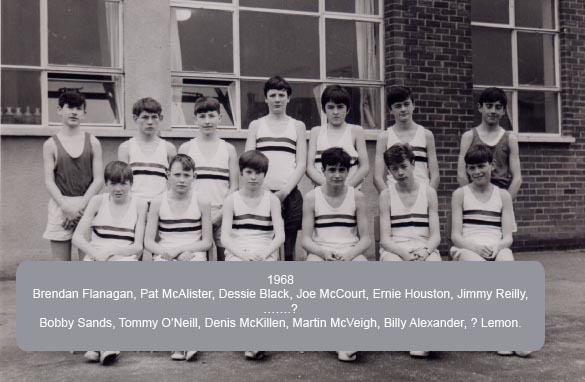 Shortly after he left school he was intimidated from his workplace and the family from their home in Rathcoole; the remainder of the story is well known. The first deaths of past pupils occurred in 1972 and continued to 1994. Sharon McKenna was murdered in January 1993, the year the school closed. Most of those killed would have been known and many related to pupils within the school. Reports of shootings quickly spread and despite taking precautions that the children would not hear them some did reach the school. Last week this blog met with the Taoiseach as detailed in this space. What I neglected to report was that your man and me went from Government Building to O2 to enjoy a wonderful Willie Nelson concert. A good time was had by all, including 77 year old Willie Nelson, a troubadour par excellence. Well,Gerry I have noted , your a lucky man..a wonderful Willie Nelson concert. Willie Nelson ,not only a living legend, he is an American Institution and even a Icon. As our international community is complacent to a faut, the Arab world impotent to a faut,Gaza will be contained, Israelwill have a thriving economy an electorate that regards the dominance of the army ,as a way of life, this conflict and the oppression of the Palestinianswill continue. U.S. support of the Bush initiated and Obama implemented commitment of $30 billion of U.S. tax dollars in military aid to Israel over a decades, ensures Israel's military power (nuclear and conventional) remains unchallengeable. YOur are ver right Gerry, Like North Ireland, we must mobilise international opinion and political pressure to achieve freedom and justice. To this end a new level of committal is needed. A note concerning the school, that Bobby Sands was but a part and the greater part he played in history.Only one who devotes himself to a cause with his whole strength and soul can be a true master. Bobby Sands was the mastere of his soul. Great causes and and great losses are as one together.